Until recently, there was much talk that the two-party system of British politics was broken, possibly forever. In 2015, just two-thirds of the electorate voted Conservative or Labour. But in the 2017 General Election, the two major parties won over 82 per cent of the vote between them. The return of the two party model has come at a time of great political turbulence in Britain. Although a Conservative party leader has occupied 10 Downing Street since 2010, their political power and approval within the British electorate has neither at any point been strong nor stable over the last eight years. 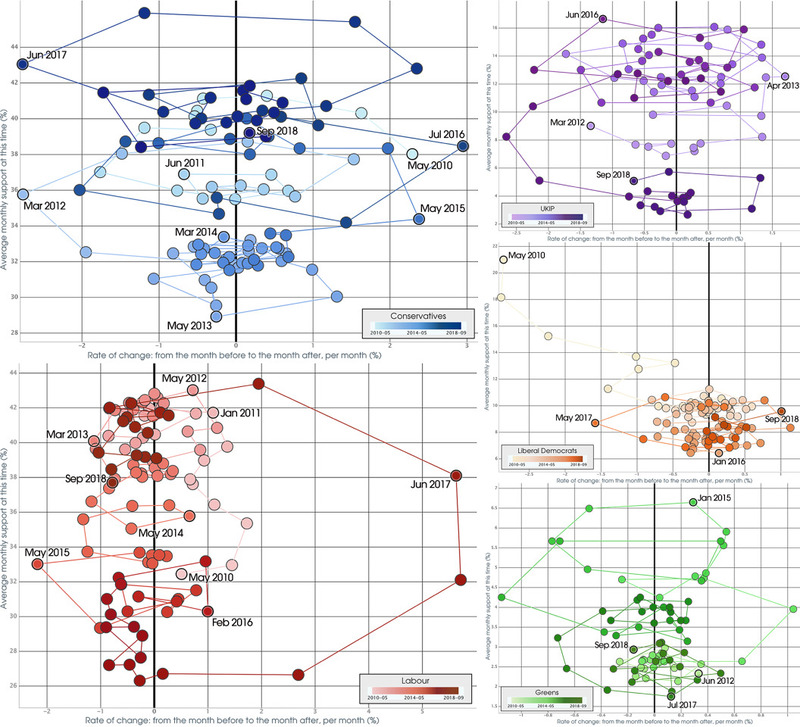 This analysis looks at the monthly polling data of all major political parties since May 2010 until the end of September 2018. (UKIP’s polling data covers dates from March 2012, the Green Party from June 2012 as it was only from then that voting intentions for these parties were both routinely asked.) Below, each circular dot is the simple arithmetic average of all publicly reported opinion polls taken in that month in the UK. The average level of support as a proportion of all those who say they have a political preference is shown on the y-axis of the graphs, and is plotted against the rate of change in that support shown on the x-axis. The most recent data appears darkest in each graph, while the colours slowly fade the further back the dots go in time. This allows us to show the dynamic nature of the intended voting behaviour revealed by the electorate in polls in a way that concentrates attention on what matters most of all in politics: change. On the bigger picture, the graphs show the temporary points of stability around which public opinion appears to oscillate until something big happens and that collective opinion is jolted in another direction, at which point it appears to try and settle down again. When looking at polling drawn in this kind of way it appears as if the voting public are enacting the collective machinations of a hive mind, coming to a settled view for a time before a chunk of voters or potential voters break away, change their minds, and then opinion settles again for a few months or even years around what appears to be a fixed level of support with only little change. Within the time period shown here the most momentous change related to Britain’s current political situation is mirrored in the changing support for UKIP. UKIP hit their maximum near 17 per cent support in June 2016 – exactly at the point of the EU referendum. As of September 2018, their support was at five per cent and falling. Their big fall in support from March to May 2017 was when the Conservative vote share rose. UKIP votes went mostly to the Tories in the run up to the general election. Some 90 per cent of UKIP voters have been revealed by surveys to be Conservative supporters that were lured by UKIP’s single policy issue. The belief that it was Labour that had lost support to UKIP and which could gain from recruiting their supporters turns out to have been unfounded. The same was true of the National Front (NF) in the late 1970s who saw their vote collapse into the Conservative win of 1979, which was bolstered by NF voters. The British National Party (BNP) played a similar role of weaning votes most away from the Conservative party which then mostly returned to that party at various points between 2001 and 2010. The Conservative graph shows that there were three key periods when their show in the polls hovered around 36 per cent; then 32 per cent; then 40 per cent. After a brief but insufficient rise in spring 2017, the Tory vote has dropped back nearer or just below the 40 per cent level. The Labour surge in the run up to the last General Election, from April to June 2017 reveals a shift in public opinion at a speed and of an extent that has never happened before so quickly for any party – ever. Today, Labour hover at around 38 per cent. For Labour to win a possible upcoming election would require that election being held at a time coincident with a sympathetic trajectory of these phase-space curves. While the party has demonstrated before that such a substantial swing is possible from much lower levels of support in the opinion polls, we have no idea whether Labour could do this again, so quickly, from the higher base of 38 per cent that they now oscillate around. If Labour cannot achieve a similar swing in future then they could well rely on the SNP to form a coalition (we have no space here to show the trajectories of SNP voting or other smaller parties). The Liberal Democrats as well as the Green Party show much smaller and diminishing dynamics in the smaller graphs shown here. The Liberal Democrats’ most important change is happening right at the beginning of this data series when support for them fell substantially with the shock of that party forming a coalition with the Conservatives. They have never recovered from that. The Green Party graph shows a brief relative rise in the polls, starting in late 2014 and continuing into 2015, before dropping down to their current three-four per cent levels. Both changes of these smaller parties, and the decline of UKIP, show how brief the period was during which the electorate seemed to have abandoned the two-party political system; at least brief for now. Despite being sometimes more strongly opinionated against (or for) Brexit, the smaller parties no longer benefit from these divisions. The electorate has turned back to supporting either of the two largest parties. The Brexit decision, coupled with the reality of first-past-the-post’s limited options, have contributed to a revival of the two-party politics in Westminster politics – for now at least. Finally, it is worth noting that the opinion polls tend to lag the actual election outcomes of 2010 and 2015. When asked how they might vote if an election was held tomorrow, people on average replied as if asked how they might have voted had an election be held six weeks ago! Benjamin D. Hennig is an Associate Professor in Geography at the University of Iceland and an Honorary Research Associate at the University of Oxford. Danny Dorling is the Halford Mackinder Professor in Geography in the School of Geography and the Environment at the University of Oxford. For a PDF of this article and link to journal webpage click here.